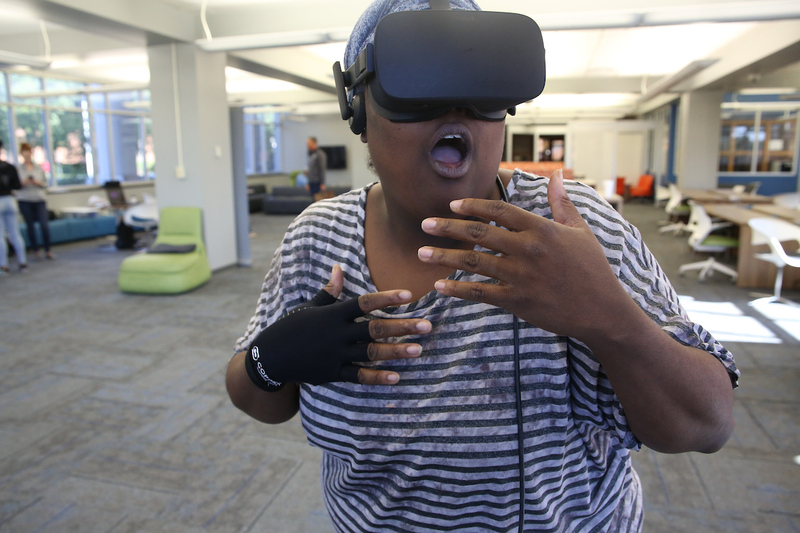 If Alzheimer’s patients can regain memory and PTSD sufferers can find normalcy after entering a virtual reality (VR) world, then you’ll understand why Jackson State University is embracing the technology to change its teaching methods. Aside from virtual reality, the newly created JSU Center for Innovation, Entrepreneurship Economic Development (CIEED) also aims to promote and facilitate entrepreneurship, create intellectual property and foster economic development. 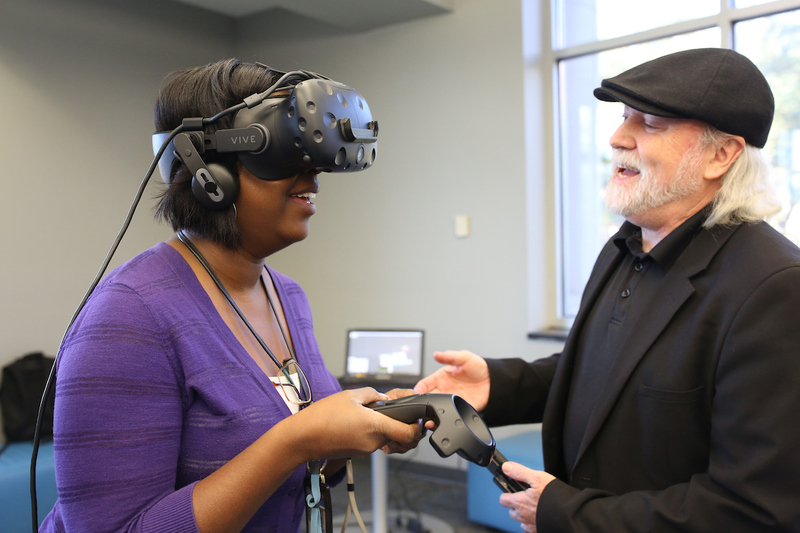 To help ideas flourish, JSU recently invited two industry partners to campus to showcase how VR can better train students and professors in all academic disciplines. 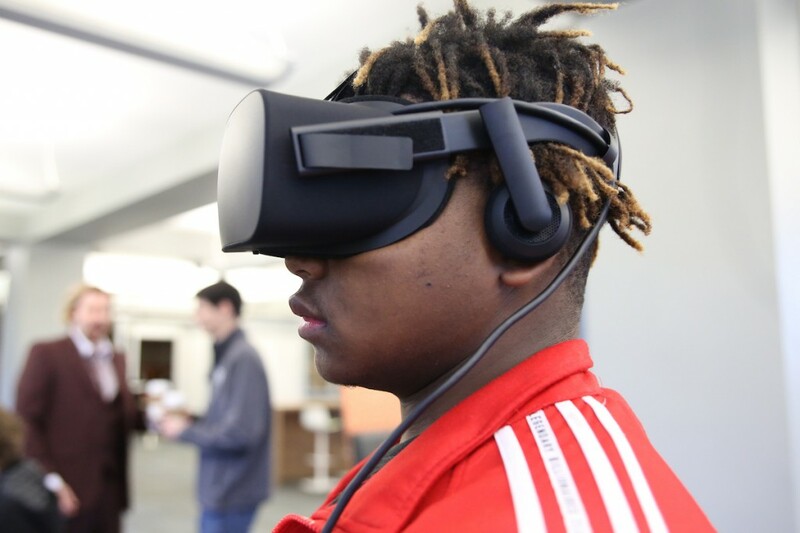 The partners – Lobaki Inc., a virtual reality creator, and Global Training Institute (GTI), a curricula developer – shared some initial results using VR equipment, specifically Oculus goggles. Inside the Create center in the H.P. Jacobs Library, their presentations intrigued curious spectators, who watched people wearing the headgear and flailing their hands in the air as if under an invisible attack. 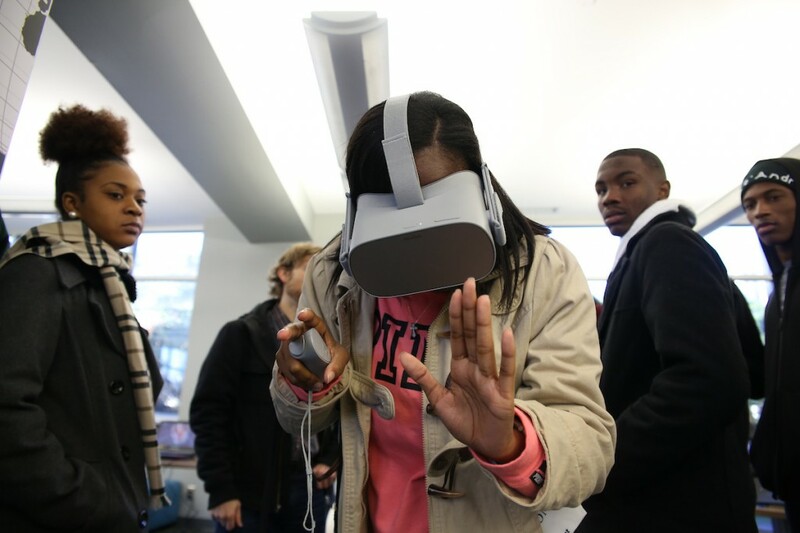 In fact, the participants had ventured into a world of virtual reality. 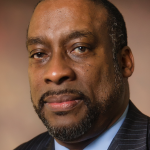 Dr. Joseph A. Whittaker, associate provost/vice president for Research and Economic Development at JSU, hails VR as a tool that can complement coursework and prepare students for careers related to technology and design in computational sciences. 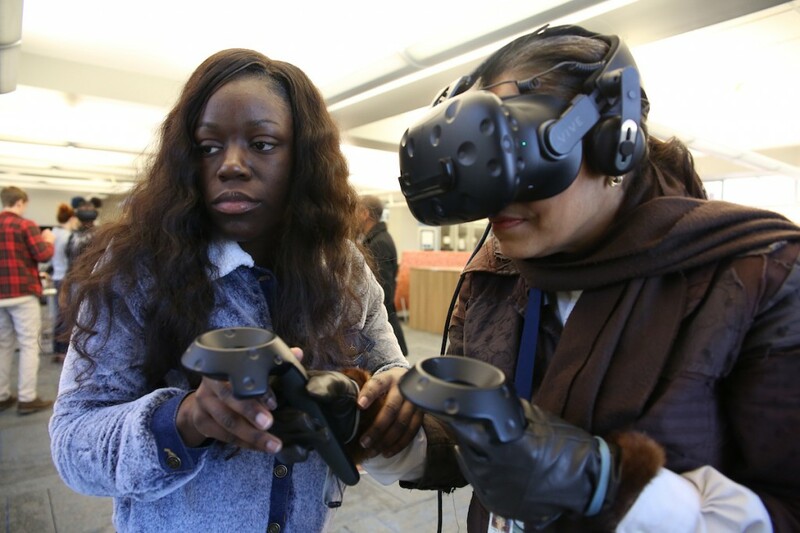 While the demonstration showed how virtual reality can be integrated into faculty teaching and research, he said staff and community stakeholders can also realize its future possibilities. Whittaker said JSU is working with GTI through its NSF iCorps program that helps innovators align their business and technology goals for commercialization purposes. For example, GTI is helping the university with biomedical and science training by linking JSU’s academic programs to GTI’s practical side in health sciences. Afterward, Lobaki enters the picture by creating the virtual reality experience. The man behind VR is Vince Jordan, who started Lobaki with his son. The idea for the company’s name came from a book in a library that defined Lobaki as a Tibetan spirit guide. Jordan added that his company wanted to leverage the technology for use in therapeutic practices with doctors and other healthcare professionals. “One of the biggest things we want to do with this technology is to guide people in a good place.” He said there are trials underway in Cedars Sinai Hospital in Los Angeles with VR and opioid addiction. He also said an experiment helped amputees overcome “phantom pain syndrome” by restoring an extremity using VR. A few years ago, he relocated from Colorado to Clarksdale in the Mississippi Delta, where he introduced students to the technology. He strategically chose to work in communities that are often marginalized after a friend conducting an assessment test indicated that Delta students are just as capable of excelling as those from affluent schools and communities. 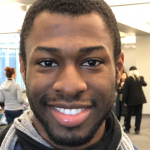 Eventually, Jordan assigned some of the students to his company’s software developers and network operations center to expand their skills. In summer 2017, several of them created from scratch a storyboard and a game called “Fall Fear Fly Redemption.” They arranged set and character design, animation, writing and sound. The game provides an immersive experience as participants take a leap of faith to see where their journey takes them. The product was published on Steam and has since sold in 16 countries. Shorty after that, Jordan’s team traveled throughout the Delta and eventually created a VR Academy to train other young people for VR jobs in Mississippi and beyond. Now, Jordan is replicating the academies throughout the Delta. He hopes to train some inmates for future VR jobs as they prepare for release from prison. 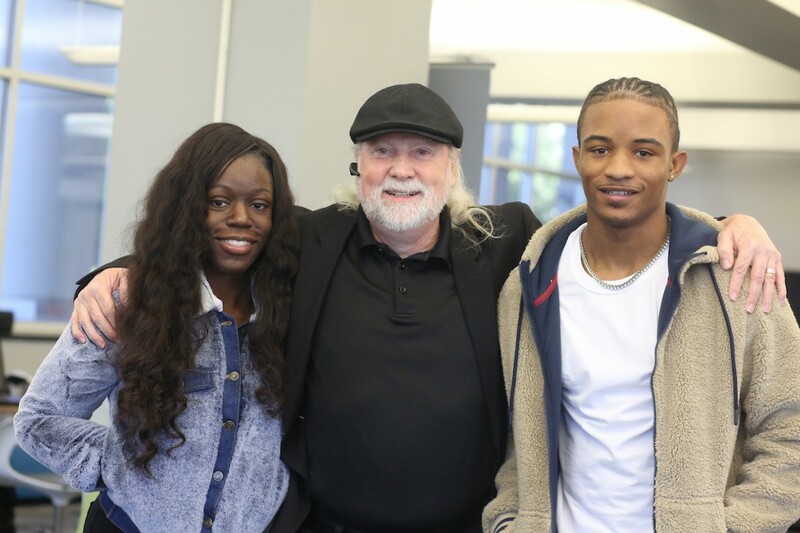 Two teenagers who met Jordan by happenstance in Clarksdale are working full time with him now as VR developers at Lobaki. 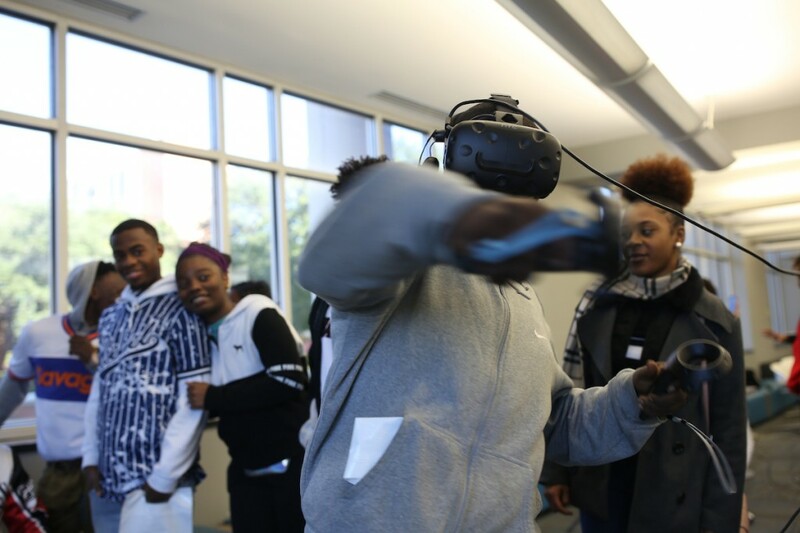 They helped JSU participants experience VR. 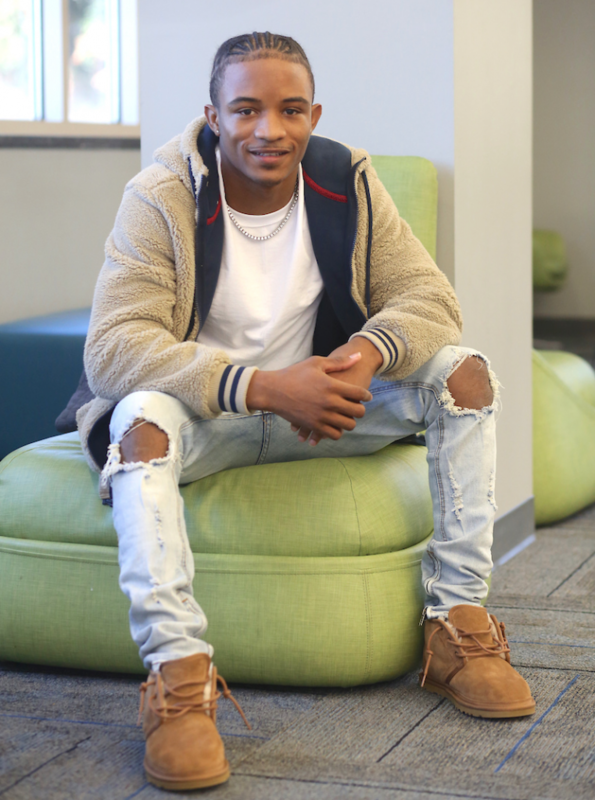 Deuntay Williams, 18, helps develop education and health applications. He grew up watching videos, and his curiosity landed him a lucrative job. Deuntay said he expects the technology to have a dramatic impact on the world. “I hope virtual reality keeps going and change a lot of people’s lives like it changed mine. I hope I stay healthy and take care of myself because I don’t want my lungs to start looking like an abnormal or diseased lung as in the VR presentation. For people who have been smoking, put them in VR and show them how their lungs would look if they keep on doing what they’re doing,” he said. The other young worker is Shalin Jewett, 19, also of Clarksdale. She joined the Lobaki team while still a student at Clarksdale High School. Shalin said she had a tentative plan for life after high school “but I didn’t know if it would work out. Then, I met Mr. Vince.” The rest is history as she would eventually become a VR curator. Basically, she develops VR programs by using popular game engines called “unreal” and “real.” Once completed, Shalin puts people in the “experience” and make them feel comfortable and unafraid. One thing she wants the world to know about VR is that it’s a better alternative to the Internet for learning about subjects. “A whole lot of new technology is coming out in the world, and VR is a big part of it. A lot of people still don’t know about it,” Shalin said. Vince Jordan is proud of both his workers, who have struggled with some family challenges. They see him as a father figure, and Jordan calls them “master animators.” He points out that VR isn’t coding. “It’s more like making a movie because you build these elaborate sets and creatures.” He said the devices Shalin and Deuntay work with are the same tools used in Marvel Comics, whose animators make $125,000 a year. Yet, Jordan marvels at the skills of his young workers, who had partial high school experience when they first joined the company. Meanwhile, the median salary for these young animators is about $75,000 a year, and a lot of these skills set can be acquired in six months to a year through the academy. “We’re so thankful GTI has a triangulation between Dr. Whittaker’s leadership here at JSU and Lobaki. The stars aligned, and we all developed an agreement. 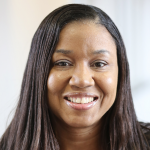 … If we can use technology with really great content, we can change what the next generation looks like,” said Powe, who believes today’s youth are far less likely to read books than previous generations. As a result, he urges the creation of learning modules that incorporate virtual reality that students would find more practical. 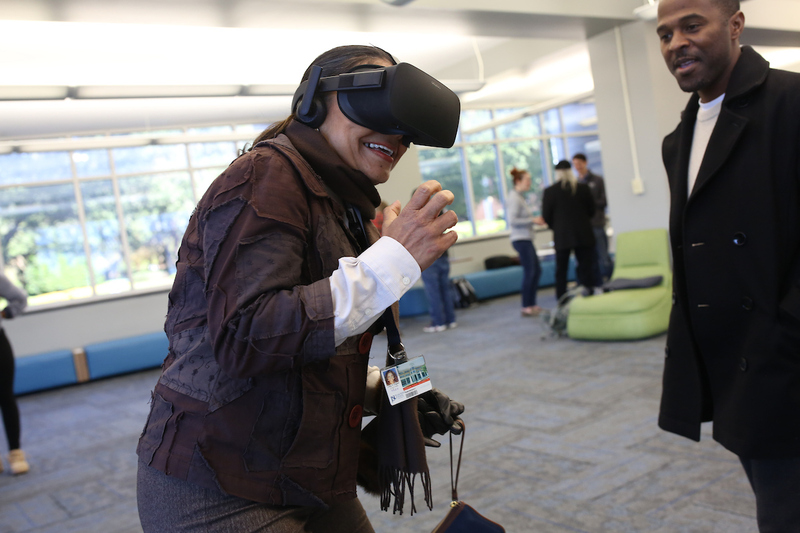 “VR is not the end all, but it’s a really great way to capture interest,” Powe said. Will Moon, another GTI partner, said the company’s educational component focuses primarily on healthcare, law enforcement and military training within the medical sector. GTI gathers and compiles the content; creates a narrative and storyboard; and plays out the scenario. Lobaki, which is also on the front end, begins the building phase using virtual reality. “We do skills and procedures for post-graduate training. We do suturing, test-tube innovation, emergency techniques and a lot of hospital and primary-care medicine. On the military side, we do pre-deployment treatment for the medics. We run them through exercises so that before they get into a combat zone they know how to handle trauma and better manage the situation they are about to encounter,” Moon said. She had urged Lobaki and GTI to participate in the university’s nine-week iCorps program that would teach them how to develop their ideas further for commercialization. 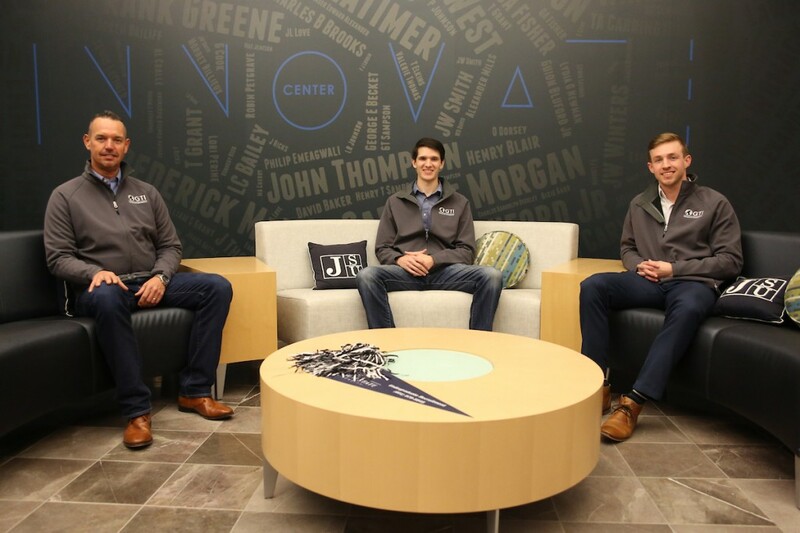 The NSF-funded JSU I-Corps Site helps faculty, students and innovators generate their business model and provides intensive training in the Lean Start Up Methodology. Stephen Uwaezuoke of New Orleans is a JSU doctoral student in business administration. He’s “pretty interested” in virtual reality. Moon tells the story of an elderly patient who has struggled with Alzheimer’s disease for several years. She couldn’t remember her granddaughter, so Lobaki’s Jordan used a headset to transport her onto a beach. He informed her there would be dinosaurs venturing around and asked if she would be OK with that. She agreed and proceeded to walk on the beach with prehistoric animals. Even though the patient can’t remember her granddaughter’s visits, the older woman remembers the beach scene. Now, the company believes that using VR to place the granddaughter on the beach as an avatar may trigger the patient’s memory of her granddaughter. For a full VR experience, GTI recommends Oculus Go, which is the newest technology that came out in July and costs about $200. The company believes that by 2020 wireless connectivity will make virtual reality completely relevant. 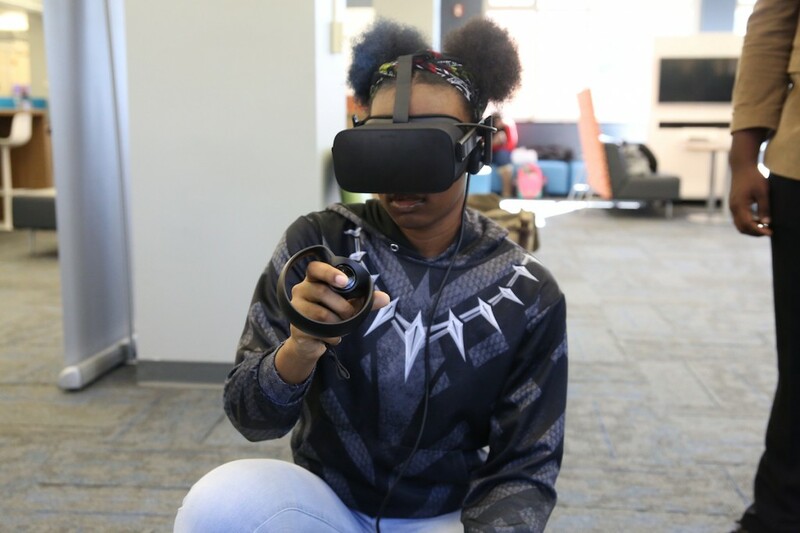 Meanwhile, JSU aims to have its VR Lab up and running by the end of spring 2019.